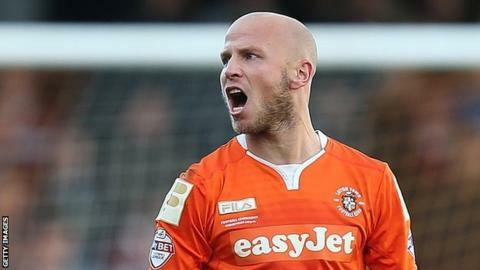 Luton Town ended a five-match winless run with a routine victory at struggling Dagenham & Redbridge. The visitors went ahead when Luke Guttridge collected Josh McQuoid's flick from a long ball and poked home. Alex Lawless tucked in his first goal of the season to double the Hatters' lead against the run of play, after a mistake by goalkeeper Liam O'Brien. The result leaves Dagenham without a home win so far this season, while Luton move up to 13th in League Two. Match ends, Dagenham and Redbridge 0, Luton Town 2. Second Half ends, Dagenham and Redbridge 0, Luton Town 2. Jack Connors (Dagenham and Redbridge) wins a free kick on the right wing. Foul by Craig Mackail-Smith (Luton Town). Foul by Matt McClure (Dagenham and Redbridge). Josh McQuoid (Luton Town) wins a free kick in the defensive half. Justin Hoyte (Dagenham and Redbridge) wins a free kick on the left wing. Foul by Josh McQuoid (Luton Town). Substitution, Luton Town. Cameron McGeehan replaces Alex Lawless. Attempt missed. Jamie Cureton (Dagenham and Redbridge) right footed shot from outside the box is high and wide to the right. Attempt blocked. Jake Mulraney (Dagenham and Redbridge) right footed shot from outside the box is blocked. Corner, Luton Town. Conceded by Justin Hoyte. Jamie Cureton (Dagenham and Redbridge) is shown the yellow card for a bad foul. Foul by Jamie Cureton (Dagenham and Redbridge). Scott Cuthbert (Luton Town) wins a free kick in the attacking half. Joss Labadie (Dagenham and Redbridge) wins a free kick in the attacking half. Corner, Dagenham and Redbridge. Conceded by Scott Griffiths. Foul by Ashley Hemmings (Dagenham and Redbridge). Sean Long (Luton Town) wins a free kick in the defensive half. Josh McQuoid (Luton Town) wins a free kick in the attacking half. Attempt missed. Josh McQuoid (Luton Town) header from the centre of the box is just a bit too high. Substitution, Dagenham and Redbridge. Matt McClure replaces Ashley Chambers. Foul by James Dunne (Dagenham and Redbridge). Nathan Doyle (Luton Town) wins a free kick in the attacking half. Attempt missed. Ashley Chambers (Dagenham and Redbridge) left footed shot from outside the box is too high. Substitution, Luton Town. Craig Mackail-Smith replaces Jack Marriott. Goal! Dagenham and Redbridge 0, Luton Town 2. Alex Lawless (Luton Town) right footed shot from the centre of the box to the centre of the goal. Assisted by Luke Guttridge. Attempt missed. Ashley Hemmings (Dagenham and Redbridge) right footed shot from the centre of the box is close, but misses to the left following a fast break. Attempt missed. Joss Labadie (Dagenham and Redbridge) right footed shot from outside the box is too high from a direct free kick. James Dunne (Dagenham and Redbridge) wins a free kick in the defensive half. Foul by Luke Guttridge (Luton Town). Foul by Nathan Doyle (Luton Town). Joss Labadie (Dagenham and Redbridge) is shown the yellow card. Scott Griffiths (Luton Town) wins a free kick in the defensive half. Foul by Joss Labadie (Dagenham and Redbridge). Corner, Dagenham and Redbridge. Conceded by Scott Cuthbert.